While the MagicFest this weekend was limited, we still got plenty of Guilds Standard with an MTGO PTQ, an SCG Team Open, and a Classic. They couldn’t be much more different either. 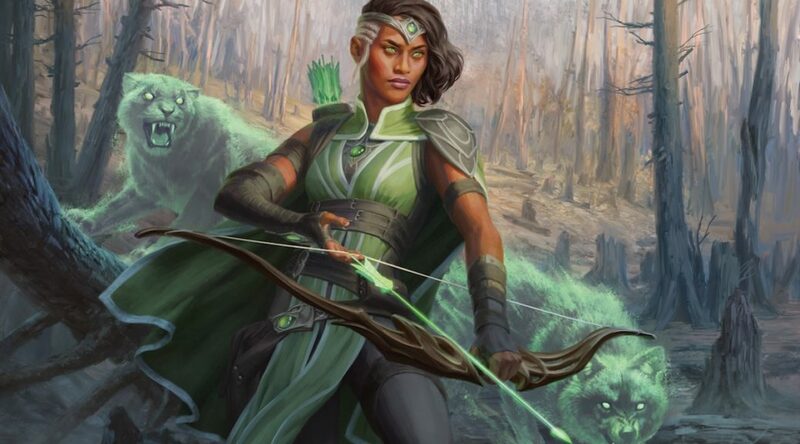 MTGO saw a strong performance by Golgari strategies, particularly explore. Selesnya tokens took the top two slots of SCG’s Team Open (the only place they even showed up), while the Classic was all about Boros Angels (and Mono-Blue Aggro?). There’s a lot of data here, and undoubtedly a lot of noise. I’m going to try and find some of the stronger threads for you guys, which is no easy feat. Given this variety of well-performing decks, there’s no doubt a lot of them will fall away in the next few weeks. Few Golgari lists didn’t bring along Jadelight Ranger for the weekend. She does a lot of work for the strategy, either functioning as a strong threat or a card drawing engine. Either way you’re not upset. Add in Wildgrowth Walker and Merfolk Branchwalker and you’re getting a lot of payoff early in the game. Will it be good enough six weeks from now? That’s hard to say, but it sure seemed to be this weekend. Jadelight Ranger is a known quantity, and was “the next Tireless Tracker” at release. Reception cooled thereafter, with the card having dropped from $12 at its peak to about $6.50 or $7 today. Should Golgari Explore continue to succeed as a strategy, especially into the Pro Tour, we could see prices above the past peak, and possibly upwards of $15 to $20. Ixalan is the senior set these days, which is always good for prices up through January or so. A second surge in price would almost certainly exceed the past peak. I of course can’t tell you whether Golgari Explore has legs. That’s up for the metagame to decide. I can tell you that Jadelight Ranger was everywhere this weekend, and if that sort of action keeps up, she won’t stay $7. Golgari Explore felt like the most common theme I saw across the three events this weekend. If it wasn’t, then Boros Angels was. It strikes me as an odd strategy admittedly, playing eight 2’s, eight 3’s, six 4’s, and four 5’s. For a curve with no fixing, no ramp, and no real card advantage, I’m left wondering what their strategy is other than “draw an ideal mix of lands and spells.” Clearly it worked, because it did so well overall. Still though. Odd setup. Of all the cards in Boros Angels, Resplendent Angel looks the best positioned. She’s what I would consider a relative unknown, in she’s hasn’t been a flashy or hyped card prior to this. While Lyra Dawnbringer was getting a lot of traction during late Dominaria spoiler season, I don’t really remember having heard much about Resplendent Angel at all since Core 19’s release. Her price curve supports my theory, with basically a consistent decline since release. Should Midrange Angels (Call it “Boros Midrangels” you cowards) continue to perform, Resplendent seems the most likely to rise in price. She’s likely one of the most important parts of the strategy, since she fills in a lower place on the mana curve that angels typically don’t hang out in. $12 is a high buy in for a Standard card, but there’s a metagame where she’s easily $25, so it’s worth at least keeping an eye on. Standard isn’t the only format where Ravnica is making its presence known. A popular commander this week is the new Niv Mizzet, Parun. He’s all about drawing cards and playing instants and sorceries, just like every other Niv Mizzet. Each has a slightly different ideal trigger condition, and in Parun’s case, it’s casting an instant or sorcery. The more you cast, the more you draw, the more damage you deal. There’s a well known suite of blue and red spells-matter cards in EDH, so this isn’t completely fresh territory in the way that some of our other new Commanders may be, such as Aminatou. Still, that doesn’t mean there aren’t opportunities. While browsing the popular cards for Niv Mizzet, Parun, I found Jace’s Sanctum. We all would have noticed it at release as a good pickup for EDH, but at the time it was too early to act. Not any longer. Foils are sitting at about $2, which is the same price they’ve been for about three years. Why do we care today, as opposed to three years ago? Well for one thing, there are only five NM copies on TCGPlayer. There are zero on ABU. SCG has 19, but they’re $3 instead of $2. Overall Sanctum feels ripe to hit $6 to $8 in six to twelve months.